There will be a meeting of the Fort Scott Land Bank held on Tuesday, October 2nd, 2018 at 5:00 p.m. in the City Commission meeting room at 123 S. Main Street. This meeting will be held to continue to discuss the policies of the Land Bank and to review two sample policies. There will be a majority of the City Commissioners present, but no City Commission business will be conducted. The regular meeting of the Fort Scott City Commission was held September 18th, 2018 at 6:00 p.m. in the City Commission Room, 123 S. Main, Fort Scott, Kansas. AUDIENCE IN ATTENDANCE: Janet Braun, Travis Shelton, Rhonda Dunn, Paul Ballou, Darrell Parker, Tom Robertson, Steve Buerge, Jerry Witt, Robert Uhler, Chad Brown, Lisa Walther, Valetta Cannon, Dominic Cannon, Ashley Cannon, Kaylee Cannon, Roger Carswell, Kim Rutter, Sara Ellis, Olive Ellis, Kerry Pommier, Mila Newman, Ronda Bailey, Gabrielle Studer, Martha Scott, Clara Dunn, Larry Gazaway, Deb Needleman, and Clayton Miller, and representing the press, Jason Silvers, Fort Scott Tribune. PROCLAMATIONS/RECOGNITIONS: Valetta Cannon – Southeast Kansas Library System Excellence Award presentation – Lisa Walther, Library Director, introduced Roger Carswell and Kim Rutter with the Southeast Kansas Library System. Mr. Carswell presented Valetta Cannon with the Excellence Award. Ms. Cannon was nominated by Lisa Walther. A check for $1,000 was presented to the Fort Scott Public Library, and a trophy was given to Ms. Cannon. Her name will also be inscribed on a traveling plaque with other award winners. The City Commission also presented her with a Certificate of Recognition. Ms. Cannon thanked the City and the great community that supports the local library. Approval of minutes of the regular meeting of September 4th, 2018. Approval of Appropriation Ordinance 1223-A totaling $406,758.85. Resolution 35-2018 – Notice of Hearing with Reference to Alleged Unsafe and Dangerous Structure and Accessory Structure located at 302 S. Lowman Street – Public Hearing Date – 10/16/2018 – 6:15 p.m. Resolution 36-2018 – Notice of Hearing with Reference to Alleged Unsafe and Dangerous Structure and Accessory Structure located at 421 W. 5th Street – Public Hearing Date – 10/16/2018 – 6:15 p.m. Resolution 37-2018 – Notice of Hearing with Reference to Alleged Unsafe and Dangerous Structure and Accessory Structure located at 1110 Scott Avenue – Public Hearing Date – 10/16/2018 – 6:15 p.m. Resolution 39-2018 – Notice of Hearing with Reference to Alleged Unsafe and Dangerous Accessory Structure located in a vacant lot south of 711 S. Barbee Street – Public Hearing Date – 10/16/2018 – 6:15 p.m.
Parker moved the Consent Agenda. Nichols seconded. All voted aye. APPEARANCE: Tom Robertson – October 26th, 2018 – Zombie Run – 5K Race – Gunn Park – Tom Robertson asked for approval to use Gunn Park to host a Zombie 5K Race on Friday, October 26th, 2018. The park would close to the public around 9 p.m. and registration would begin at the top of the park around 10:00 p.m. with the race beginning at 11:00 p.m. All proceeds from this race will go to the Christmas in the Park event to be held the first weekend in December. Bartelsmeyer moved to approve the Zombie Run 5K Race to be held on October 26th, 2018 at Gunn Park. Adamson seconded. All voted aye. APPROVED TO HOLD ZOMBIE RUN 5K RACE ON OCTOBER 26TH, 2018 AT GUNN PARK. Mitchell moved to open the Public Hearing at 6:11 p.m. Parker seconded. All voted aye. OPENED PUBLIC HEARING AT 6:11 P.M.
6:00 p.m. – Public Hearing – Vacation of Street – Barbee Street – between 10th & 11th Street between Barbee and Little – Fort Scott Christian Heights c/o Terry Chance and Cecil J. & Cynthia K. Feagins, Jr. – (Jerry Witt) – Approval of Ordinance #3539 – Jerry Witt said that he is on the board for the Christian Heights School and they have requested that this street be vacated. It has never been a street and is on the school property as well as on the Feagins property. There is a drainage issue which the City is working on. Both property owners signed the petition. Bartelsmeyer moved to approve the ordinance vacating Barbee Street between 10th & 11th on Barbee and Little. Parker seconded. All voted aye. APPROVED ORDINANCE NO 3539 VACATING THE PLATTED STREET ALSO KNOWN AS LINDEN STREET LOCATED SOUTH OF 10TH STREET BETWEEN LOTS 2, 4, 6, 8, 10, 12, 14 & 16, BLOCK 1, PLEASANT VIEW ADDITION AND LOTS 1, 3, 5, 6, 7, 10, 11 & 12, BLOCK 2, PLEASANT VIEW ADDITION TO THE CITY OF FORT SCOTT, KANSAS MORE COMMONLY KNOWN AT BARBEE STREET BETWEEN 10TH AND 11TH STREET BETWEEN BARBEE AND LITTLE STREETS – FORT SCOTT CHRISTIAN HEIGHTS C/O TERRY CHANCE AND CECIL J. & CYNTHIA K. FEAGINS, JR.
Mitchell moved to close the Public Hearing at 6:15 p.m. Bartelsmeyer seconded. All voted aye. CLOSED PUBLIC HEARING AT 6:15 P.M.
Mitchell moved to open the Public Hearing at 6:15 p.m. Parker seconded. All voted aye. 6:15 p.m. – Resolution 38-2018 directing the repair or removal of an unsafe and dangerous structure and accessory structure located at 111 S. Little Street – Rhonda Dunn, Finance/Codes Director, informed the Commission that there was a fire at this structure approximately two years ago. This structure belongs to James Marshall and he is cooperating with the City. He has asked for time to remove his personal belongings from the structure. She asked for a time frame of two weeks for him to either repair or remove this structure. Bartelsmeyer moved to give two weeks to repair or remove this structure at 111 S. Little. Adamson seconded. All voted aye. APPROVED RESOLUTION NO. 38-2018 DIRECTING THE REPAIR OR REMOVAL OF AN UNSAFE AND DANGEROUS STRUCTURE LOCATED AT 111 S. LITTLE STREET. STRUCTURE MUST BE BROUGHT UP TO 2012 INTERNATIONAL BUILDING CODE BY OCTOBER 5TH, 2018 OR DEMOLITION PROCEEDINGS WILL BEGIN. Rhonda gave an update on 1601 E. Wall Street and that since no progress has been made, demolition bids will be sent out. Riverfront Grant submittal update – Jerry Witt, Chairperson, Riverfront Committee, informed the Commission that there is a lot going on at the Riverfront. The new overlook structure is almost complete. Mercy Hospice has a memorial space made with bricks and has seating at this location also. Last Monday, a grant was submitted to K.D.O.T. in the amount of $1,364,400 for the relocation of the Long Shoals Bridge. There is K.D.O.T. funding available and the deadline for submission of the grant was Monday, September 10th. The City Manager signed the grant application. He thanked the City for their help in submitting this grant. He has also applied for a Kansas Department of Wildlife and Parks grant for a children’s play area. It would consist of a natural play area in the middle of the park. He should know if the City was awarded this soon. City Manager said that he did sign the grant application due to the time frame it needed for submittal. He reminded the Commission that the Riverfront Committee is responsible for raising the matching funds for this grant. Parker moved to approve the submittal of the Long Shoals Bridge Relocation Grant to K.D.O.T. signed by the City Manager. Adamson seconded. All voted aye. APPROVED THE SUBMITTAL OF THE LONG SHOALS BRIDGE RELOCATION GRANT TO K.D.O.T. SIGNED BY THE CITY MANAGER. Comprehensive Plan update – Rachel Pruitt, Economic Development Director, informed the Commission that due to the hard work of the Planning Commission, Commissioner Parker, Allyson Turvey, and Rhonda Dunn the Comprehensive Plan is complete. A public hearing will need to be held for the formal adoption of this plan. Parker moved to approve to hold a public hearing to adopt the new Comprehensive Plan. Bartelsmeyer seconded. All voted aye. APPROVED TO HOLD A PUBLIC HEARING TO REVIEW THE NEW COMPREHENSIVE PLAN. Consideration of Bids – Waterway Mowing – Rhonda Dunn, Finance/Codes Director, informed the Commission that the City has a lot of waterways to maintain. She had two waterways bid out recently where they need to be cleaned out badly so the water can flow properly. There were five bids received. This was bid in two sections with one area at 7th and National and the other area on 23rd Street to Highway 69. The low bid is from SMM Holdings which is Kenneth and Steve Mason. This is a new company just getting started. She asked for approval for the bid at 7th and National in the amount of $2,975. She would like to see how they perform the work at this location first before awarding the other location. They are the low bid for the 23rd Street location also. She asked for approval for the location at 7th & National in the amount of $2,975 to SMM Holdings. Nichols moved to award the 7th & National waterway bid to SMM Holdings in the amount of $2,975.00. Mitchell seconded. All voted aye. AWARDED THE 7TH AND NATIONAL WATERWAY BID TO SMM HOLDINGS OF FORT SCOTT, KANSAS IN THE AMOUNT OF $2,975.00. Director Updates: Rhonda Dunn – Ms. Dunn informed the Commission that she has a great team of employees that are reporting to her. Tyler, the City’s software company, will be here on October 16-18 for training for her and any employees that need additional training. She is reviewing every invoice paid by the City and looking for ways to save money. The Codes Department is also doing well, although she is not in the same building with them now. Rachel Pruitt – Thanked Steve Buerge and Bourbon County Economic Development Council, Inc. for their assistance and all they do for the City. The City’s Comprehensive Plan is nearing completion, and the next step is to strategize on implementation. BEDCO has recommended contracting with experts for further guidance and direction. 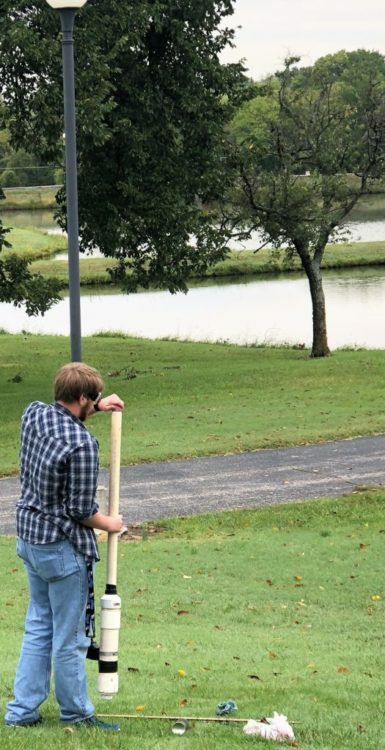 Steve Buerge said that he spent all day recently with City officials and with an engineering firm called Waggoner & Associates of Mississippi. With over 40 years of experience, Waggoner and Associates manage comprehensive infrastructure, economic development, and housing programs that improve quality of life. Their services will offer perspective on capital funding, implementation, and program management strategies as well as the implementation which will help transform our community. Bedco has hired this firm and will be paying for them to assist Bedco and the City. Dave Martin said that he is proud to announce that the new Community Development Director for the City is Robert Uhler. The job was posted and they interviewed three individuals. Robert has experience in lobbying and working with state and federal officials. Robert started last Monday. Robert Uhler said that he appreciates the opportunity to work for the City of Fort Scott. They choose to live here and love Fort Scott. He thanked the City for their vote of confidence. Bartelsmeyer – Welcomed Robert Uhler to the City team. Nichols – Thanked Jerry Witt for his help with Riverfront Park. He also thanked Steve Buerge and Bedco. He is excited about this project with Waggoner & Associates. He is glad to see that Rhonda is looking for ways to save money with the City’s finances. Parker – Echoed Commissioner Nichol’s comments. Mitchell – Welcomed Robert Uhler also. Thanked Steve Buerge for the amazing job he does with Bedco. C. City Attorney: Informed the Commission and public to go by the City’s golf course. It has never looked better than it does right now. The new cart shed is completed and the old cart shed has been demolished. It looks amazing. City Attorney asked for a 10-minute executive session with just the City Commission present to discuss non-elected personnel. There is no action anticipated. Nichols moved to move into Executive Session for 10 minutes to discuss non-elected personnel to include City Commission and City Attorney. There is no action anticipated. Parker seconded. All voted aye. WENT INTO EXECUTIVE SESSION AT 6:50 P.M.
Rachel Pruitt announced that there will be a liquor by the drink informative meeting on Saturday, September 22nd, at the Elks Lodge. Tickets for dinner are $20.00 each which will be used for marketing materials. Mitchell moved to adjourn the meeting at 7:01 p.m. Adamson seconded. All voted aye. ADJOURNED MEETING AT 7:01 P.M. The next regularly scheduled meeting is to be held on October 2nd, 2018 at 6:00 p.m.
Approval of minutes of the regular meeting of September 18th, 2018. Approval of Appropriation Ordinance 1224-A totaling $284,542.13. Resolution 40-2018 – Notice of Hearing with Reference to Alleged Unsafe and Dangerous Structure located at 14 S. Margrave – Public Hearing Date – 11/20/2018 – 6:15 p.m.
Chris Sather – Tigers on the Move Event at Riverfront Trails – 10/12/2018 – 5:00 – 6:30 p.m. The Gunn Park Trails volunteers would like to invite everyone to enjoy the fall weather and join us for the 6th annual Tri-yak-a-thon. This year’s proceeds will benefit the new bike share program. The event will take place on October 13 at 10:00 AM in Gunn Park. The Tri-yak-a-thon is a race where participants run on Gunn Park’s beautiful trails, kayak up and down the Marmaton River, and then tackle the trails again on a bike. The goal of the event is to have fun and raise money to support the bike share program. The trail run is approximately 4 miles, the kayak portion is 2.5 miles, and the final portion is a 7-mile mountain bike ride. Participate as a relay team, or if you are tough enough you can do the entire race as a solo participant. You must bring your own kayak, life jacket, helmet, and mountain bike. Riders must wear a helmet. Onsite registration and packet pickup will be from 8:00 to 9:45 AM at Shelter House 6. You can register online at https://www.trireg.com/tri-yak-a-thon. The race will begin at 10:00 AM. Whether you enter the race or just come and cheer, please join us and support our park, our trails, and our bike share program. Saturdays: Stocker & Feeder Cattle, followed by any cows & bulls that come in late Friday & Saturday. Cafe open both sale days. You don’t have to be a buyer just to come watch the sale and visit the cafe! 50-min. narrated Trolley Tours of Historic Fort Scott on the hour, Fridays 11am-4pm, Saturdays 10am-4pm, leaving from the Convention & Visitors Bureau at 231 E. Wall St., $6 adults, $4 children 12 and under, last tour leaves at 3pm. Friday Night Concert in the Park – Heritage Park Pavilion, 1st and Main St. in downtown Fort Scott, 7-8pm – the show will feature a group of performers drawn from Allen, Bourbon and Linn Counties. Some of the performers will be familiar to regular concert attendees while others will be making their first appearance. They are all very accomplished musicians and entertainers. The program will be similar to one presented by this group last year that was very well received. Farmers’ Market – Skubitz Plaza in front of the Fort, 8am-12pm. You will find homegrown and freshly picked fruits, vegetables, herbs & more in addition to baked goods and some craft items. Patriot Ale Unveiling at the Boiler Room Brewhaus, 12:10pm, Come see us for the unveiling of the “Patriot Ale” at the Boiler Room Brewhaus. We will have BBQ, baked beans, smoked diced potatoes and a Patriot Ale for $10. A portion of the proceeds will go to the purchase of wreaths at Fort Scott National Cemetery #1. Farmers’ Market – Skubitz Plaza in front of the Fort, 4-6pm. You will find homegrown and freshly picked fruits, vegetables, herbs & more in addition to baked goods and some craft items. Franklin Torres warming a hydrogen-filled balloon. 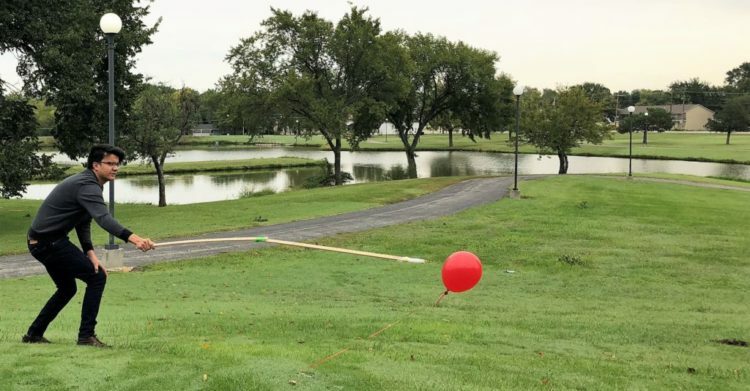 On the morning of September 26, the STEM Club at Fort Scott Community College held demonstrations to show other students what STEM Club is all about. There is an extra bonus for joining the club. The STEM club offers a scholarship to pay for books and tuition up to 15 credit hours to all qualifying members. 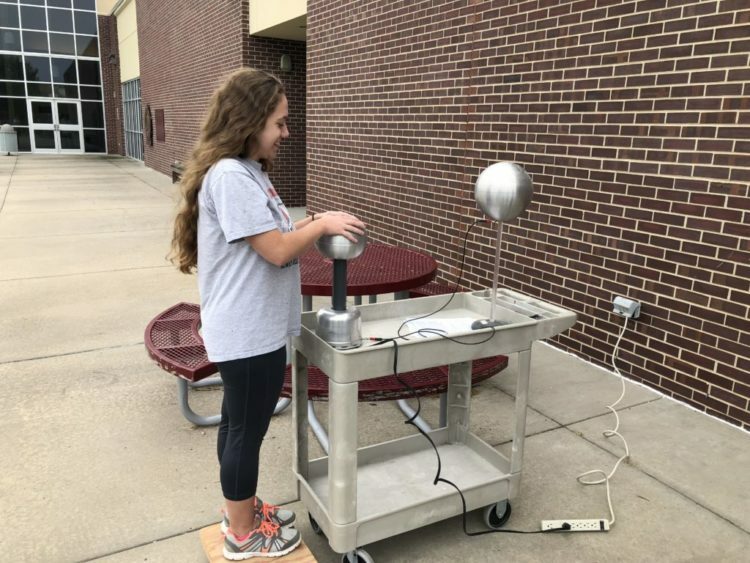 The club demonstrations Wednesday included the shooting of a potato gun, the bursting of hydrogen-filled balloons, and even some hair-raising with electricity using a Van de Graaff Generator, provided by Elie Riachi, the FSCC Physics, and Physical Science Instructor. Trenton Allison loading the potato gun. Students joined in, during their passing periods, to watch the demonstration and enjoy a donut or two, donated by Fort Scott’s Price Chopper. The current STEM Club members would like to be a part of more activities and competitions, but they do not currently have enough members to do so. The FSCC STEM Club is searching for eager students to join them. 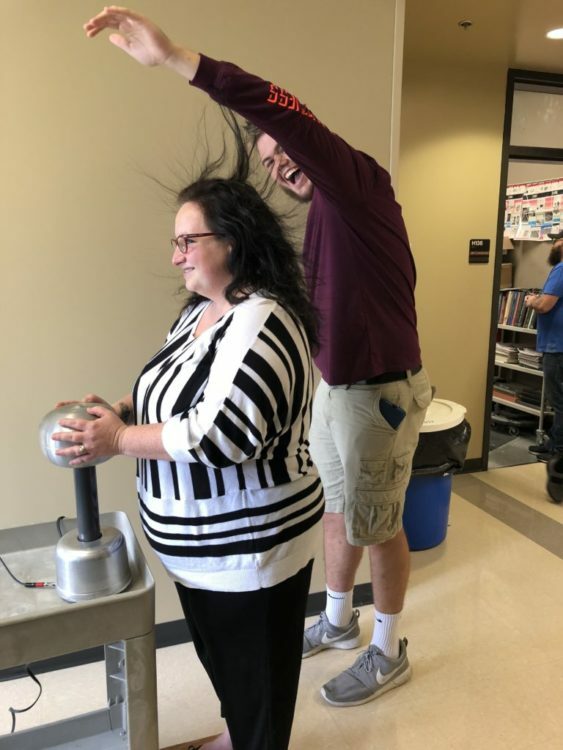 FSCC Student Megan Thomas takes part in the hair raising experiment, using the Van Der Graaff Generator. This club creates an opportunity for students to learn more about these subject areas, while also having fun doing some interesting experiments and even some engineering. For example, Trenton Allison, a STEM Club Member, built his own drone. 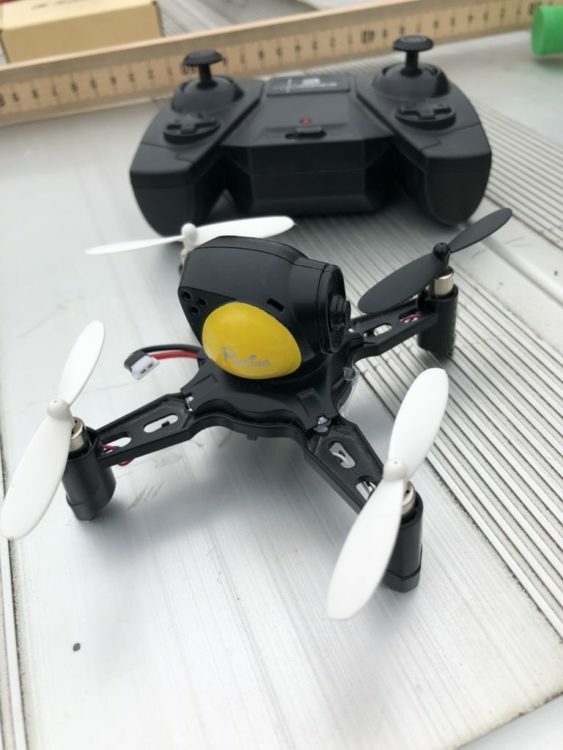 FSCC studentTrenton Allison’s drone he built. The STEM Club is sponsored by Robert Doyle, FSCC’s Chemistry Instructor. Consider joining the STEM Club today and become a part of something that makes learning fun. For more information, contact Mr. Doyle via email at robertd@fortscott.edu. The daily reports can best be viewed on a computer. Click below, then click on the image to enlarge it. The daily reports are best viewed on a computer. Click below then click on the image to enlarge. With Dave asleep and my ten-dollar-missionary-money due at this morning’s Bible study, I needed to retrieve my emergency stash from its hiding place. Imagine my surprise when I found not only a ten-dollar bill but a one–hundred-dollar one as well. It was Christmas in September! I happily stuffed the money into my purse, headed to the Bible study and placed my $10 in the missionary collection. Which was ridiculous. This was not Monopoly money. These bills were made to look real, and other than their size, thinness and that nearly invisible “Play Money” wording, could fool anyone…well, except Sherlock Dave. Thankfully, I had not tried to pass my counterfeit find off at Price Chopper, the top of my errand list. But then it dawned on me. What if my $10 missionary payment also was play money? And what if next Monday, Billie Jo Drake, our Bible study leader, held it up and asked if anyone in our group was missing a fake, ten-dollar bill? Yikes! When Dave realized that I was clueless (Save your comments), he seemed stunned that I had made such a careless mistake. (Seriously? We’ve been married 45 years. He should be used to this by now). Still, my immediate problem was not my husband; it was having to admit to Billie Jo that I was an idiot. My happiness, like the Play Money wording, was fading. Could I somehow avoid this phone call? Pride sure wanted me to. I reminded myself that little things like repenting to Bible study leaders is minor compared to acknowledging my failings to God, even though He knows about my sins (and yours—you’re not off the hook here) before I even commit them. Which, when you think about it, should make contrition rather easy. And it would be, were it not for Pride. Blame it on Adam and Eve. They were the ones who originally disobeyed and hid from God instead of repenting, and since Pride worked so well in the Garden of Eden, maybe that is why Satan relies on it being just as effective today. But there is hope! Even though erring is part of our sinful condition, repenting is a privilege of our Christian condition. It’s true. God doesn’t bang His head on a table when His children mess up. He knows what we are going to do before we do it. All He asks is that we ask for forgiveness. It was time to call Billie Jo and…Gulp… try to explain what I had done. She was gracious, checked the bills and told me that none were phonies. I thanked her (and Jesus) and hung up. Hubby wasn’t quite so understanding. He stood there with his hand outstretched, expecting me to give back his twenty-dollar bills and definitely not happy that he had been had…proving my point that no one is exempt from Pride. Moving Forward: Online educational and life coaching program that teaches Problem Solving skills (8 classes) to help Veterans to better handle life’s challenges. It is designed to be especially helpful for Veterans, Military Service Members, and their families. The Mindfulness Coach App provides you with tools and guided exercises to help you practice mindfulness, which means paying purposeful attention to the present moment without passing judgment on it or your feelings. Mindfulness Coach can be used alone, but is not intended as a substitute for therapy (iPhone only). The PTSD Coach App helps you learn about and cope with the symptoms related to Posttraumatic Stress (PTS) that occur following trauma. PTSD Coach can be used alone, but is not intended as a substitute for mental health treatment. The Virtual Hope Box (VHB ) contains simple tools to help patients with coping, relaxation, distraction, and positive thinking. Patients and providers can work together to personalize the VHB content on the patient’s own smartphone according to the patient’s specific needs. Breathe2Relax is a portable stress management tool. Breathe2Relax is a hands-on diaphragmatic breathing exercise. Breathing exercises have been documented to decrease the body’s ‘fight-or-flight’ (stress) response, and help with mood stabilization, anger control, substance use urges, and anxiety management. Tactical Breather App can be used to gain control over physiological and psychological responses to stress. Through repetitive practice and training, anyone can learn to gain control of your heart rate, emotions, concentration, and other physiological and psychological responses to your body during stressful situations. Moving Forward App provides on-the-go tools and teaches problem solving skills to overcome obstacles and deal with stress. It is especially helpful in managing challenges such as: returning to civilian life, balancing school and family life, financial difficulties, relationship problems, difficult career decisions, and coping with physical injuries. T2 Mood Tracker App: The app records a range of emotions for anxiety, depression, head injury, stress, posttraumatic stress and a user’s general well-being. Users can also create items to track their progress in unique areas. The saved results are displayed in an easy-understand graph. The data is saved in a graphical or spreadsheet file which can be transferred by e-mail or other wireless connection. Life Armor: Comprehensive learning and self-management tool to assist with common mental health concerns. Contains information on 17 topics, including sleep, depression, anger, relationship issues, substance use, and post-traumatic stress. Brief self-assessments help the user measure and track their symptoms, and tools are available to assist with managing specific problems. Together Strong: Interactive app that lets you practice what to say and do when a peer is struggling with adjustment to civilian life. Through interactive role-play and simulations, you’ll become prepared to have a conversation that will motivate a friend to seek help, build resilience, and lead a positive life. Stay Quit Coach App helps you “stay quit” after you stop smoking with tools to control cravings, reminder messages and support links. Stay Quit Coach is best used while in treatment with a therapist or after your treatment has ended. MOVE! Coach Mobile (MCM) is a weight loss app for Veterans, service members, their families who want to lose weight. This 19-week program can monitor, track,and receive feedback regarding progress with weight, diet, and exercise goals. This app also helps teach SMART goals and problem-solving skills to overcome barriers. Positive Activity Jackpot (Android/Google play only): Positive Activity Jackpot uses a professional behavioral health therapy called pleasant event scheduling (PES), which is used to overcome depression and build resilience. This app features technology to help users find nearby enjoyable activities and makes activity suggestions with local options and the ability to invite friends. BioZen: This app takes many of the large medical sensors in a clinic and puts them in the hands of anyone with a smart phone. Showing real-time data from multiple body sensors including electroencephalogram (EEG), electromyography (EMG), galvanic skin response (GSR), electrocardiogram (ECG or EKG), respiratory rate, and skin temperature to show users their meditative & attentive cognitive states. WebMD Pain Coach App offers a holistic approach to balancing lifestyle with chronic pain conditions to help inspire a better day. It is a mobile companion to help you through daily health and wellness choices so you can better manage your chronic pain. Enjoy a personalized experience as physician-reviewed tips related to your specific condition are delivered daily to you. The App puts you in control of your lifestyle choices so you can review personal patterns to understand triggers, set goals, and easily share progress with your physician. Suicide Safe: Designed for providers, but can help Veterans and family members by equipping them with education and support resources to assess risk of suicide, communicate effectively with patients and families, determine appropriate next steps, and make referrals to treatment and community resources. Addicaid – Addiction Recovery Support: Free phone app dedicated to the prevention & treatment of addiction & alcoholism. Find and rate support meetings for a variety of addictions, track your progress, complete daily goals, and stay inspired to maintain sobriety with their newsfeed including news, videos, and music. Quit That! : Simple app to track all the habit/addiction you are trying to quit. Find out how many hours, days, minutes, weeks, or years it has been since you quit each habit/addiction. Need extra motivation? You can also keep track of how much money you have saved since quitting! Relax and Sleep Well with Glenn Harold (FREE): Twenty-nine minute guided meditation with music to help you fall and stay asleep. Relaxing and gentle, another free App available is: Relax with Andrew Johnson Lite (14 minute meditation). Sleep Bug: Can’t fall asleep to the sound of noisy neighbors or honking cars? Sleep Bug is the perfect on-demand white noise machine. Get transported to the beach, a zen garden, or the middle of a jungle with the push of a button. There’s also a custom timer and even the ability to add noises—like rain or a whale’s call—to the scene. Topeka – Governor Jeff Colyer M.D. thanked the Kansas Corporation Commission today for their unanimous decision to order pass along savings from the Tax Cuts and Jobs Act (TCJA) bill to Westar electric customers. Earlier this year, Governor Colyer sent a letter to Kansas utility companies urging them to ensure that ratepayers saw a decrease in their utility bills from the tax cuts given to utility companies by the Federal Government. The settlement was unanimously approved today by the Kansas Corporation Commission for Westar customers to receive a reduction to their electric rates of $66 million dollars annually. That is the equivalent of approximately $3.80 per month for the average residential customer. 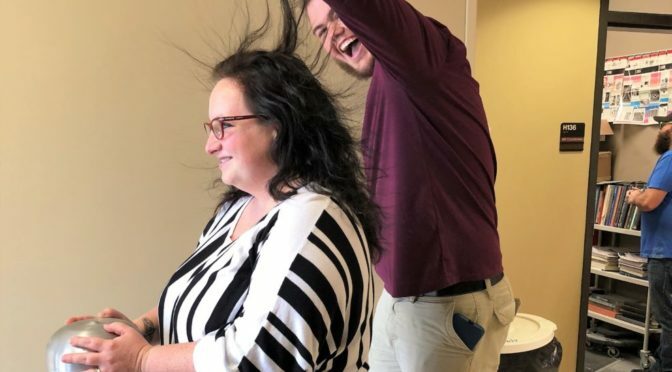 In addition, Westar has agreed to provide a one-time credit of $50 million to customers representing the tax savings received by the company since the beginning of 2018 due to the TCJA. Kansas City Power and Light, Kansas Gas Service, and other utility companies also have rate cases currently before the KCC that will consider the impact of the tax cuts to customer rates. An order regarding these companies’ utility rates will be issued by the KCC over the next several months.